We’d love your help. 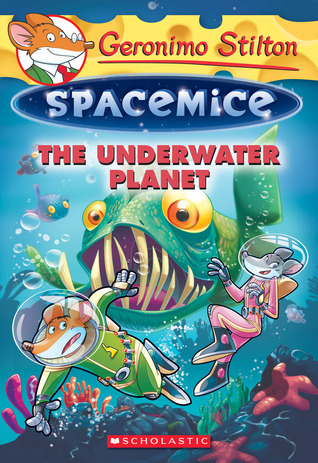 Let us know what’s wrong with this preview of The Underwater Planet by Geronimo Stilton. While at the beach, Geronimo Stiltonix stumbles upon a mysterious treasure map! The spacemice follow it and end up on Aquarix, a planet that's entirely underwater. During their exploration, they face fur-eating seaweed, ferocious piranha aliens, and . . . pirate spacecats! Squeak! Can the spacemice keep the spacecats from stealing the treasure? To ask other readers questions about The Underwater Planet, please sign up. Geronimo Stilton and his crew are off on a new series of adventures that take place in outer space. It begins with Geronimo finding a mysterious sphere on the beach biosphere of his MouseStar 1. The sphere is a map that leads them to an underwater planet filled with many unforeseen dangers. When they finally reach their map destination, they find a peaceable civilization that needs the sphere to open a locked treasure chest of great importance to them. Just then, who should arrive but Black Star Geronimo Stilton and his crew are off on a new series of adventures that take place in outer space. It begins with Geronimo finding a mysterious sphere on the beach biosphere of his MouseStar 1. The sphere is a map that leads them to an underwater planet filled with many unforeseen dangers. When they finally reach their map destination, they find a peaceable civilization that needs the sphere to open a locked treasure chest of great importance to them. Just then, who should arrive but Black Star and his band of Space Pirates and they mean to steal the treasure. Can Geronimo save the day? This is the sixth volume in the SpacemIce series for beginning chapter book readers. Most fans of the other Geronimo Stilton books will enjoy this title. The fast moving action, color illustrations, paperback format all make this appealing for readers who are on a second to fourth interest grade level. I would recommend this book for purchase by any school or public library. My kids loved this book! I have a 4 & 5 year old and I had to read this to them! But I enjoyed it just as much as they did. They were more interested because there are some pictures in the book. I recommend this for kids of all ages they will love it and because there is a series they will be able to have much more of these fun stories! every book with geronimo stilton in it is very exciting but this was the most exciting one of the creatures are kinda scary but this book was still good. Elisabetta Dami is an Italian author that currently resides in Italy. She is the author of the Geronimo Stilton series, a bestselling childrens book. She enjoys traveling the world seeking ideas for her series. She writes under a pseudonym of Geronimo Stilton. She is also a co-owner of Italian based publishing company Edizioni Piemme. Her books hav A pseudonym of Elisabetta Dami, aka Thea Stilton.